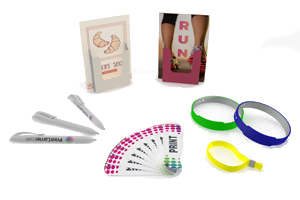 Win new fans for your company, products and services: with colourful advertising fans printed by us. In practical business card or flashy bookmark format, with up to 14 panels full of your messages. The summers are getting warmer every year. 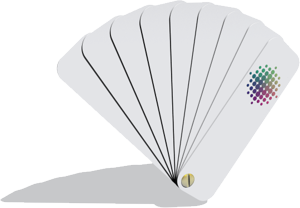 Your customers will therefore be especially pleased to feel a fresh breeze: in the form of a pocket-sized advertising fan, printed with cool offers, refreshing recipes or anything else you want to wave in front of their eyes. As the days get hotter, people start fanning themselves with increasing fervour. So to prevent your advertising fans from collapsing despite constant and vigorous use, we make them from sturdy super-white 300gsm art paper. Made to last! When we print advertising fans, we round them out nicely, at least at the corners. This way, they slip into pockets more easily. Whether you order them in business card or bookmark format. To keep your fans from getting wet or dirty, after printing them in full colour on both sides we also laminate them with glossy plastic foil – also on both sides, in other words on the front and back of every card. 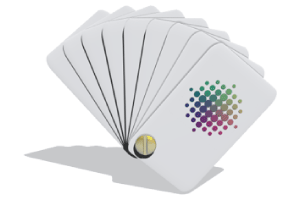 We print and laminate your fans with six, eight, ten, 12 or 14 sides. Whichever you choose, you’ll have a handful of quality. Two dozen makes 24. 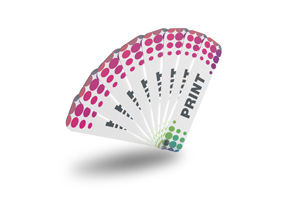 Add one, and you’ve got the smallest number of advertising fans that we will print for you: 25. 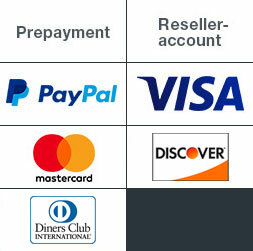 From there the available quantities increase via 50 and 100 to the maximum of 250 per order. Does the weather report predict a real heat wave for your summer party at the next weekend? Then order some advertising fans, fast! If you specify our Express service, we will produce and deliver them within six to seven working days after receiving your artwork. You can also choose our Standard service with delivery within eight working days if you have more time to plan ahead. In both cases, with no extra charge for shipping. We want you to be our fan! We want you to let us print not only your fans, but everything else that your firm needs in the way of advertising and office articles. We therefore always give our level best. If we should ever fail in this endeavour (unlikely, but accidents can happen), as a first-time customer you get your money back, and if you’ve ordered from us before we promise to resolve the issue in your favour. Our goal is long-term, top-quality customer relationships!